Karin’s wonderful resource books bring quilt making into the 21st century offering students multiple techniques within new concepts. They are packed with clear diagrams and step by step instructions taking students through from beginner to advanced. Karin uses fun, fast, accurate and efficient methods to simplify quilt making. 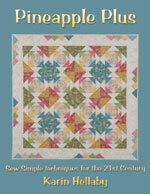 All books can be ordered/purchased from good quality quilt shops or online.